Lars Sullivan decided to have some fun at the expense of Shane McMahon when he pointed out how much the son of WWE Chairman Vince McMahon was sweating during the opening segment of this week’s RAW for the McMahon family segment with Vince McMahon, Stephanie McMahon, and Triple H.
Shane did his entrance during the segment and which includes him dancing all the way to the ring. 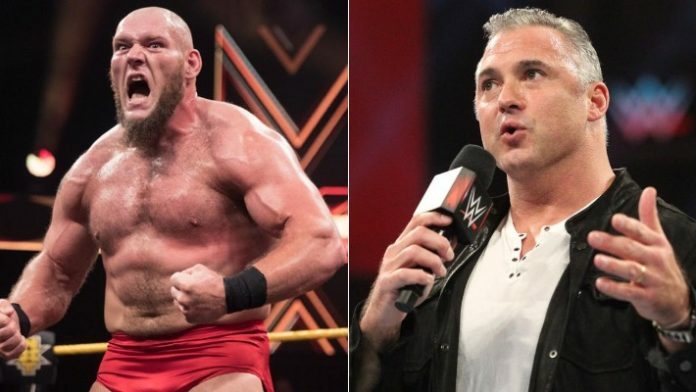 WWE has already confirmed that Sullivan will be included in the batch of several WWE NXT stars who are making their way up to the main roster. Former WWE RAW Women’s Champion Nia Jax was absent from not only this week’s episode of Monday Night RAW but also the taping for next week’s show that was taped from Sacramento, CA.